If I live to be 100 years old, I suspect I’ll still be futilely trying to educate politicians that there’s not a simplistic linear relationship between tax rates and tax revenue. You can’t double tax rates, for instance, and expect to double tax revenue. Simply stated, there’s another variable – called taxable income – that needs to be added to the equation. This simple insight is what gives us the Laffer Curve. This is common sense in the business community. No restaurant owner would ever be foolish enough to think that revenues will double if all prices increase by 100 percent. People in the real world know that this would mean lower sales. At best, revenues will rise by much less than 100 percent in that scenario. And if sales drop by enough, revenues may actually fall. Perhaps because so few of them have business experience, it seems that politicians have a hard time grasping this simple concept. The latest examples come from Europe, where the never-ending greed for more revenue has resulted in the imposition of financial transaction taxes. So how’s that working out? Are politicians collecting the revenue they expected? Hardly. Here are some of the details from a City A.M. column. …taxes on financial transactions across Europe have devastated market activity and failed to raise as much as politicians hoped, according to new figures out yesterday. The article cites three powerful examples, starting with Hungary. Hungary implemented a 0.1 per cent tax at the start of the year. But it raised less than half the revenue the state had hoped for, bringing in 13bn Hungarian Forints (£36m) in January. Wow, less than 50 percent of the revenue that politicians were expecting. But the politicians probably don’t care about the collateral damage they’re imposing on the economy because they’ll get to buy votes with another 13 billion Forints (about $55 million). Now let’s see how the French are doing. France forged ahead on its own, introducing a 0.2 per cent tax on sales of shares of major firms. But that only raised €200m (£169.4m) from August to November, well below to €530m expected. Gee, what a shame, the politicians in Paris are only getting about one-third as much money as they were expecting. That’s even worse than Hungary. But they’ll surely squander that bit of cash as fast as possible. Our last example comes from Italy. There are no revenue numbers yet, but the decline in financial activity suggests this tax also will be a flop. Though politicians may decide it’s a success since they may get more than 50 percent of what they were originally estimating. That kind of forecasting error would get somebody fired at any private business, but being a politician means never having to say you’re sorry. And it certainly never means learning from mistakes. The evidence on the Laffer Curve is ubiquitous, with powerful examples in Ireland, the United Kingdom, Italy, France, Spain, as well as Bulgaria and Romania. Or states such as Illinois, Oregon, Florida, Maryland, Washington, DC, and New York. P.S. Even President Obama has sort of acknowledged the supply-side principles that are the basis of the Laffer Curve. P.P.S. Remember that the goal of good tax policy is NOT to maximize revenue. P.P.P.S. I warned the European Union’s Taxation Commissioner about the dangers of a tax on financial transactions last year. Needless to say, my sage counsel appears to have been ignored. I have to echo that it takes a few years for the Laffer curve to take its revenge – primarily through the effect of compounding economic growth deficits. Because the main long term effect of higher taxation is the perpetually compounding opportunity cost of lower growth, growth that cannot match the world a average and thus arithmetically leads to decline. 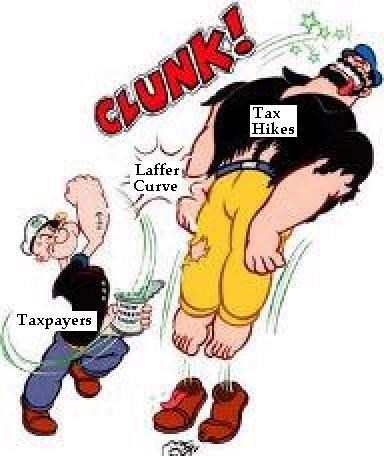 So, once again the Laffer curve presented as “we increase taxes today, what will revenue be next year” is a red herring. As one expands the time horizon to 2-5-10 years, the peak of the Laffer Curve moves towards the lower tax rates. In the end, the long term Laffer Curve becomes the same as the Rahn Curve. This simply embodies the fact that, in the long term, it is the effect on growth that dwarfs all other factors feeding government revenue. Thus, a pathetic growth Soviet Union taxing at 90%, in the end raises less money than a free market America taxing at 20%. But Americans changed their mind, and so The American collective is now centrally planning and controlling a more French-like ~40% of GDP. No wonder growth rates — and path to decline — are converging to the pathetic French levels, just like most of the rest of the western world and its voter-lemming delusions that somehow growth rates that avert decline are possible under the demotivating flatter effort-reward of redistribution and the crony one size fits all central planning. So what Mr Mitchell needs to do is convince not politicians, but voters. Politicians will be out of office in four years. And in that shorter time span, the Laffer Curve has a lot more of the shape the left dreams of. It is the voters who, in the longer term, get stuck with perpetually compounding lower growth rates to decline. But voter-lemmings, as they accept the bamboozling of collectivist politicians, have little to blame but themselves. Good points Barry. Behavior economics is clarifying the way people actually make decisions. Politicians have the wrong reference language. They speak of lowering or raising taxes, whereas they only control tax rates. What they meant to say is that they want to raise tax revenues. When conservatives speak of lowering taxes, let’s hope they mean both lowering rates and revenues, but I doubt that. On financial transactions taxes, there is a bigger issue than the immediate delta in financial transaction revenues, since such taxes affect investment. Such changes can have long duration impact on the taxable base. Is it possible that the tech boom and resulting budget surpluses of the late 90’s were a direct result of the capital gains tax reductions in 1979 and 1982? I get the Laffer curve. And the fact that the point of maximum revenue is different for long term and short term because higher tax rates slow down the growth rate and future revenue. 1) Do tax rates have a hysteresis effect? For example, if I raise the tax rates and than later drop them back down to their previous level, is there a permanent drop in revenue raised? In other words, do higher taxes train people to hide their money or not make it in the first place. And does that training persist after the high tax rates are removed? 2) Do tax rates have a viscosity to them? Not sure what term to use, but viscosity seemed appropriate. 3) Is the above viscosity dependent on the rate at which tax rates are changed. In other words, is there a difference between raising the tax rates over a long period of time rather a sharp quick change in rates.